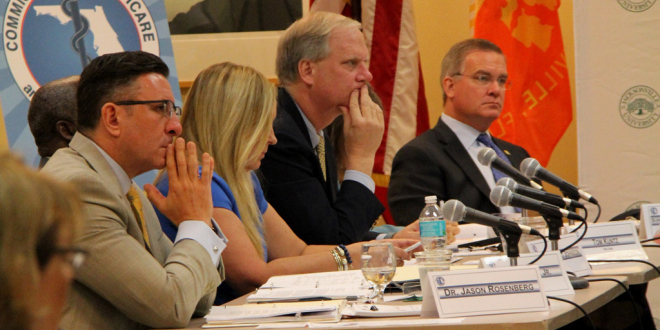 Assessing the return on investment for taxpayer funding received by hospitals was the topic of a recent meeting of the Florida Commission on Healthcare and Hospital Funding hosted by the JU Public Policy Institute. The meeting July 1 opened with comments from PPI Director Rick Mullaney, who welcomed the Commission with an introduction to Jacksonville University and the Public Policy Institute. During the meeting, the Commission heard from Ryan Fitch on hospital employee counts and salaries and wages. The panel also heard presentations by Russ Armistead, CEO of UF Health, and Donnie Romine, Interim President and CEO of St. Vincent’s HealthCare. A panel, including Nikole Helvey, MS HSA; J.J. Tepas, MD; and Jannifer Harper, MD discussed hospital quality measures. The Commission also held a brief discussion period and then took questions from the public. JU faculty, students and alumni attended, along with members of the Jacksonville community. The meeting was live-streamed by WFSU The Florida Channel. Click here to watch the meeting as broadcast by The Florida Channel. The Jacksonville University Public Policy Institute is a neutral gathering place to discuss policy matters affecting our state and local community. Offering the only Master in Public Policy degree in Florida, we prepare students for leadership and diverse career opportunities in the public, private and non-profit sectors. More information at ju.edu/ppi.